Do you monitor your traffic and social media campaigns? Do you know the exact keyword, tweets, Google+ share or Facebook like which brings traffic to your blog or business site? Monitoring, tracking and analysing your traffic data is the best and must practice for you to survive in today’s highly competitive world. Information is the key in current world irrespective of your business. Social SEO is imperative for success in current online world. Getting organic traffic is vital but also, extremely competitive. You need to put additional efforts to optimize your blog or site in order to get optimum results from search engines and social media sites. Social SEO has become a reality and social signal pays a great deal of influence in your search engine rankings. If you haven’t implemented Twitter card in your blog then go and implement it. Twitter card adds media content to your tweets and when your posts are tweeted, you can control how your content is displayed on Twitter. You must implement Twitter card on your blog. I have used SEOpressor to implement Twitter card. You can use same tool or some other to implement it. Learn more about Social SEO. You must focus on social media marketing and Twitter marketing is one of the primary pillar of social media marketing along with Facebook and Google+ marketing. There are millions of tweets and shares on Twitter and Facebook every day. You cannot survive without looking into your traffic stats and figuring out “What working” and “what’s not working”. Therefore you must analyse your traffic data in order to monitor and track the success or failure of a particular campaign. Social media is one of the best tools to drive huge amount of traffic to your blog and website. Twitter is one of the biggest social networking sites, after Facebook, which can completely change your fortune. It has been long understood and there are millions of bloggers, business houses and marketers using twitter to promote their businesses and blogs. Creating a profile on twitter or accessing it to Tweet is not only free but also, easy. But what really is tough to “stand out of the crowd”. If you have proper and adequate information about what is getting tweeted or retweeted from your blog, you can further enhance the quality of your campaign and extract more traffic from it. So it’s like you publish many posts on your blog. Some are tweeted more than others and some tweets get more RTs from your followers and fellows on Twitter. If you know that then you can craft your twitter marketing campaign in that direction and attract better exposure on twitter. Therefore, Twitter marketing and Twitter analytics, both plays a very vital role in online business strategy. Twitter Analytics is one of the Twitter best practices. There are varieties of tools you need to monitor and track your twitter marketing campaigns. In fact, if you are not tracking any social media campaign, then you should start doing that. You should ‘not only’ track twitter traffic but also, Traffic from Facebook and Google+ also. In this post we are going to talk about tools which can be used to completely and thoroughly track and monitor twitter traffic while touching some of Facebook and Goolge+ stuff. Analytics for Twitter 2013 & 2010 (Microsoft office 2010 & 2013 add-on) – if you are using Microsoft office 2010 or 2013, then you can use ‘analytics for 2013 or 2010’ add-on/extension of Microsoft for twitter analytics. You can use it to build reports inside Microsoft excel. You can create reports for Tweets, hashtags, @usernames and keywords. 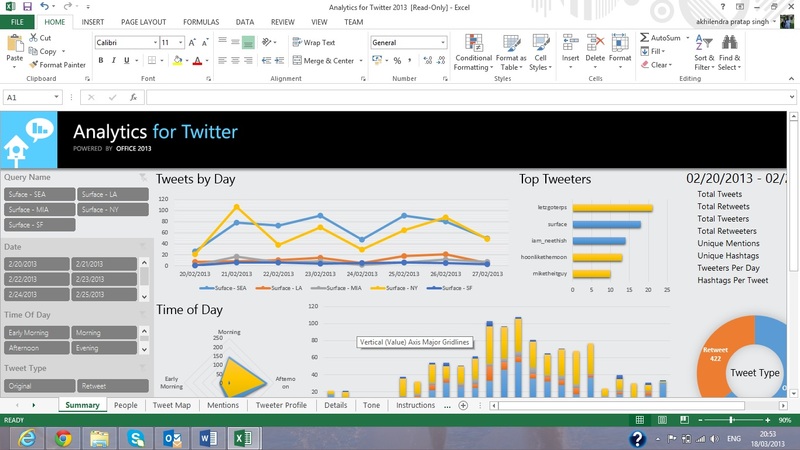 Analytics for Twitter 2013 is very good tools for those who are using Microsoft excel. Topics & mentions along with time and top tweeters. Tweet map to display the location of your tweeters. If you are using other tools to monitor traffic from social media sites like Facebook and Google+ and looking out for something to manage twitter analytics, then look no further. It will satisfy most of your requirements related to twitter analytics. It is a really good tool which provide adequate information to boost your twitter marketing. If you are already using microsoft office then it is one of the best free twitter analysis tools. Hootsuite – it is a comprehensive social media marketing campaign solution. Hootsuite is a social media dashboard and provide you the tool and resources to learn and manage social media marketing. You don’t need to login to your separate social accounts like Facebook, Google+ and Twitter. You can use Hootsuite to login at one place and share content on all of these sites simultaneously without logging into these sites. So if you are not managing your social media campaign using similar tool, then it is a must tool for you. You can upload and schedule your tweets and hootsuite will automatically tweet them instead of you sticking to your computer always to tweet and share your content on twitter. It is a very good feature to manage your twitter marketing campaigns. As mentioned earlier, hootsuite provide comprehensive solution. 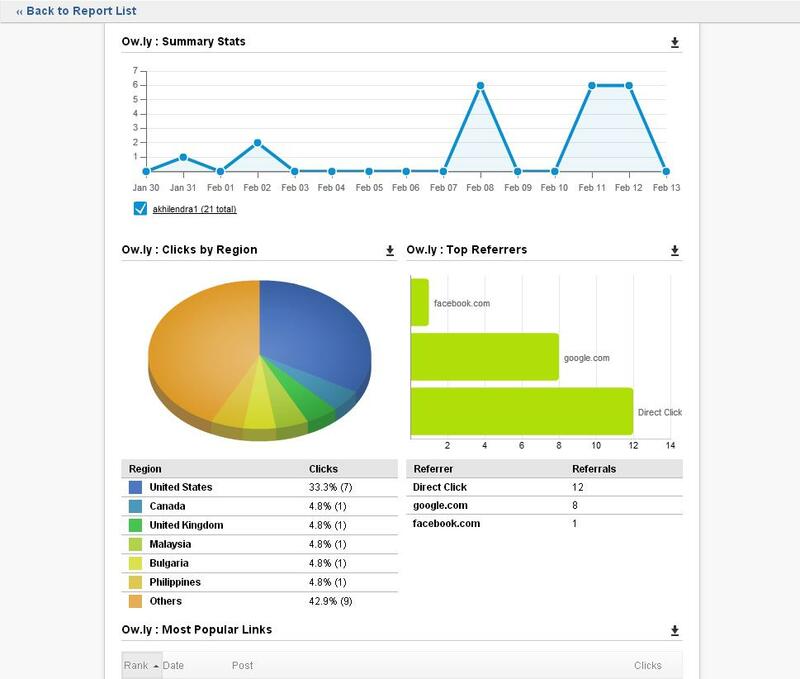 You can also use it to generate detailed Facebook Analytics Reports along with Google+ page analytics and other reports. They offer free services for limited accounts and beyond that they charge some fee. So if you are a blogger, hootsuite’s free account could be sufficient for you. For small businesses, it is fairly economical. So if you are using some other tool to run and manage your social media marketing campaign then don’t bother but if you are not using any tool to manage your social marketing campaigns, then you can think about Hootsuite. Social Metric Pro WordPress plugin– if you don’t want to invest money in acquiring Microsoft office 2013 or hootsuite and looking for something which only enable you to get reports than social metric pro is a perfect solution for you. Social metric pro is a social media analytics plugin for wordpress. Like all other wordpress plugins, social metric pro is installed within your wordpress blog and you can perform tracking, monitoring and reporting from your wordpress admin dashboard. Reports generated by social metric pro are easy to read and are presented in colourful graphics which are not only easy to read but also, attractive. Social metric is widget ready plugin so you can use these plugins to put that information anywhere on your blog, off course if you want. You can easily find out who is sharing, liking or tweeting your content on Twitter and other social networking site. As mentioned earlier, social metric pro is social media analytics plugin which is used to extract information about social media happening on your blog. Twitter is key to success in any business in current market conditions. Twitter marketing is imperative and you need to monitor your twitter analytics in order to capitalize over that. So stay focused and start gathering information about your social media marketing campaigns. These are some of the best twitter analytics tools available. Leave your comment to share your opinion about it. And yes, don’t forget to tweet it if you liked it. I am using tweetdeck and Google analytics for checking the promotion in my twitter tweets. It is very easy to use and after installing code of Google Analytics- It also show other stuffs like avg time of staying, other pages opened by the users and many more things. You can give a try to these two tools for effective twitter marketing. Don’t use to much tools for twitter tweets because the main thing of your work is creating content and if you fails in creating content for your blog and then automatically you failed in all parts of blogging. Thank you very much for sharing this post. It’s really nice of you to share what you learn and what you know about Twitter analytics tools. Hey, I learned a lot from this post. Thanks so much for sharing. You bet I would implement your suggestions and see how it will work and affect my traffic.Thanks again. Indeed, social media networking sites are one of the most effective tools that any blogger and webmaster should have in order to gain more traffic to his site. Thanks for sharing the valuable things that you know. I’ll be looking forward to more of your posts. This is quite a remarkable tool. I’m really interested to learn more about how it works. Better read up on it. Thanks for sharing your knowledge with us. I’ve heard of this and frankly it has sparked my interest. Would it also work for other Social Media sites? It would be nice if it works on other sites not just Twitter. Vianney, if you are talking about Hootsuite, then yes it can be used for other social sites also. Twitter analytics have been really helpful to me since I’ve just started using Twitter. Twitter analytics have been really helpful to me since I’ve just started using Twitter. I’ll know right away if I am on the right track. Hootsuite is a great tool for analytics. And not only for Twitter, but for other social media as well. That’s true Matt, Hootsuite can be used to manage variety of social networking site like Facebook and Google+ along with Twitter. I have mentioned that in the post, it’s just that in this post i have focused on Twitter. Thanks for stopping by and sharing your feedback.